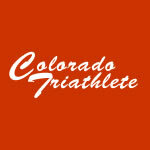 August 8, 2010 (Boulder, CO) – Almost 1,300 athletes toed the line at the inaugural Rohto Ironman 70.3 Boulder Triathlon on Sunday. 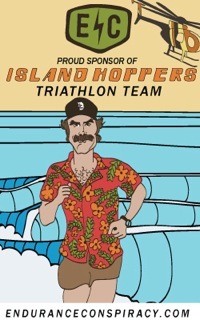 The course was exactly the same as it was when Barry Siff of 5430 Sports ran the event—except for the swim, which started near the dock and ended on the right side of the beach near the grass. 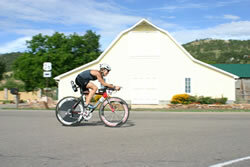 The race served as an official qualifier for the Ironman 70.3 World Championship on November 13, 2010. 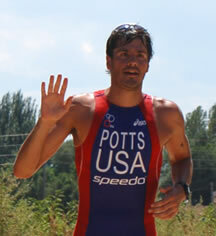 Racing for his first time in Boulder, Olympian Andy Potts came out of the water in first with Australian Steven Hackett on his heels. Hackett took an early lead on the bike followed by Potts, Bermuda’s Tyler Butterfield, Great Brittan’s Paul Ambrose and Boulder’s Tim DeBoom. Into T2 Hackett hit the run first but Potts passed him within the first mile and crossed the line with the win in 3:46:50. On the bike Potts knew he had to “hit it hard.” “I wanted to bike honestly and just push, push, push,” he said. He didn’t let up, keeping Hackett within site most of the ride. The run for him was more about staying strong until the finish. “Instead of going and pounding out the first eight miles, it was more just about being consistent mile after mile,” he said. The most memorable part of the day for Potts was seeing all the pros riding, running, and cheering for him along Highway 36. “The respect of my peers is something I strive for so the fact that they all were cheering me made today extra special,” he noted. Butterfield, who posted the fastest half marathon run split of 1:15:21 for the day, passed Hackett, finishing second overall in 3:49:18. 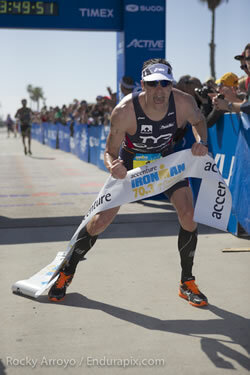 Hackett finished two minutes behind in 3:51:57. Australian Richie Cunningham and Great Britan’s Paul Ambrose rounded out the top five. Winning for the second time in as many years for the women was Great Britain’s Julie Dibens. The current Ironman 70.3 and Xterra World Champion led from the gun. She exited the water with American Rebecca Witinok-Huber on her heels. With a fast transition and holding around 25 mph on the bike, Dibens entered T2 with a five-minute cushion on second place Angela Naeth from Canada. 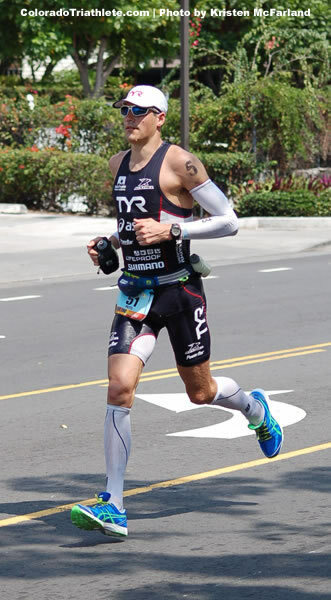 To protest the eight percent rule—a rule established by Ironman that requires competitors to finish within eight percent of the winning time to receive prize money—Dibens stopped shy of the finish line for approximately five minutes. She slapped hands, signed autographs and hugged her mother and father before crossing the finish line in 4:19:46. The time she conceded allowed her fellow competitors to gain enough to receive their prize money. The controversial rule is set to expire on September 1 this year. She also noted the great support of so many other athletes including her competitors while out on Highway 36 and other parts of the course. “It was awesome to have them cheering,” she said. Angela Naeth crossed the line in second with a time of 4:22:27 while American Jessica Meyers finished third in 4:25:09. Uli Bromme and Rebecca Witinok-Huber rounded off the women’s top five. In age-group competition, Boulder triathlete and mother of two, Brandy Rothman, held off her closest competitors in a tight race. Rothman, who was fifth out of the water in her division, had to make up a six minute and eight second deficit to catch Amanda Durner, who was the first female out of the water. After riding the 56 mile bike section of the course at the blistering pace of 23.38 mph, Rothman closed in on the leading racers Amanda Durner, Wendy Mader and Laura Borglet and narrowed the six minute and eight second lead previously enjoyed by Amanda Durner to under ten seconds. Heading out on the run, Rothman looked fresh and light while the three women ahead of her were showing signs of exhaustion under the cloudless skies and 90 degree heat. Run splits are not usually what puts Rothman on the podium, but her 7 minute and 35 seconds per mile pace on the 13.1 mile run was enough to catch Laura Borglet, Wendy Mader, Amanda Durner and hold off Kelly Lear-Kaul to eventually win the race by one minute and four seconds for an overall time of 4:38:46. Rothman credits her strong run in the sweltering heat on the unshaded course to her experience fighting wild land fire on two different US Forest Service hot shot crews during her college years. She credits her overall performance to her coaches, Dave Scott (six time Ironman world champion) and Jane Scott, and to her husband and two children for all of their support. Brian Schaning of Colorado Springs claimed the top spot among age-group men with his time of 4:05:16. Tim Hola of Highlands Ranch was the second amateur male in 4:07:12, while Jim Hallberg of Longmont took third in 4:08:48.